2019 Annual Meeting & Election of 2019 Officers Plus: “Chester's Citizens in the Great War” by Aaron Lefkowitz! 2 pm Saturday January 19 (Snow date 20) at the 1915 Erie Station. urday 10-Noon until May 26th. Please, no: dirty items, textbooks, computers, clothing, upholstered furniture, used personal care items, Baby car seats, mattresses, or pieces too large or heavy for one person to carry. Raise the Roof Fundraiser - Help fix our 104 year old Erie Train Station roof leaks. Sunday, February 24, 2019 12:00 – 2:00 p.m. at Colonial Lanes, 78 Brookside Avenue. $15:00 Per Person. Call Annie: 845-629-3694 for tickets & info. “The Chain That Saved the Colonies” by Doc Bayne - Saturday, March 23, 2019 - 2:00 p.m. at the 1915 Erie Station in Historic Downtown Chester (19 Winkler Place, Chester, NY 10918). "What's been Lost!" from the village - Some for good; some for bad; but all for good! “What's Old is New: Erie Railroad and the Graham Line” by Bob McCue - May 4 2:00 p.m. 1915 Erie Station in Historic Downtown Chester (19 Winkler Place, Chester, NY 10918). 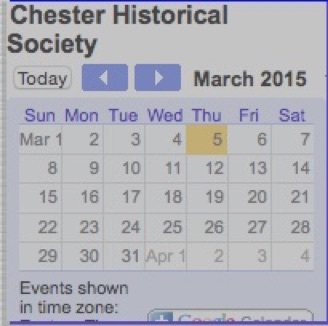 Chester McDonald's Chester Historical Soceity Fundraiser, 11 a.m. – 7 p.m. Wednesday, May 15, 2019. Chester McDonald's will donate 20% of your puchase to the Society with coupon! Donations accepted every Saturday, March to May from 9am-12 noon at the 1915 Erie Station. Spring - on Father's Day weekend (June 15-16, 2019) Pending confrimation: Jim Baird "Orange County Dairies"
Repairs to Station Roof and Gutters July – August. CHS Penny Social. September 13, 2019 - New Location: Town of Chester Recreation Building, "New Chester Senior Center," 81 Laroe Road, Chester, NY 10918 - doors open at 5:45 - calling starts at 7pm! Also: check our Calendar of events!